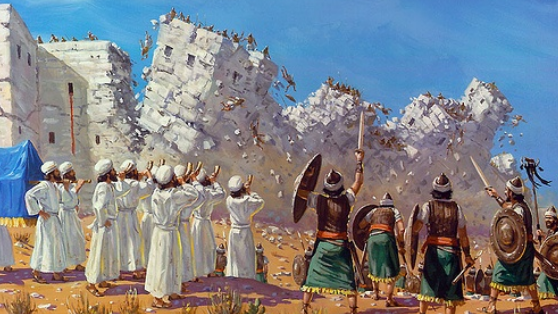 Note: This is the second article in a series on the Battle of Jericho. PURPOSE OF ARTICLE: To present evidence supporting the biblical record of the fall of Jericho. 1. Kenyon based her conclusions on the absence of pottery that would not have been there to begin with. Archeologist Bryant Wood, after writing his dissertation in 1985, became interested in Kenyon’s analysis. Interestingly enough, Kenyon died in 1978 but never saw the final publication of her work in 1981-83. Wood, who was a professor at the University of Toronto, found mistakes in Kenyon’s analysis and wrote extensively about them in Biblical Archaeology Review. Apparently, Kenyon “based her opinion almost exclusively on the absence of pottery imported from Cyprus and common to the Late Bronze I period (c. 1550-1400 B.C.E. ).”1 In other words, she believed that the city could not have been destroyed around 1400 B.C. because she found no Cyprian pottery in her excavation. But Wood points out that the absence of this kind of pottery makes perfect sense, since both Garstang and Kenyon were digging in a poor area of Jericho. In a New York Times article, John Wilford says, “Garstang…found an abundance of the simpler, everyday clay pots and bowls of that period.”2 Even Kenyon herself says of the final phase of City IV, “The picture given…is that of simple villagers. There is no suggestion at all of luxury.”3 So why would anyone expect to find exotic imported ceramics in such a place? 2. Kenyon based her conclusions on very small amounts of land. Kenyon only excavated two 26-foot by 26-foot squares of land, making her conclusions more dubious.1 Now, there is no doubt that she was a gifted archeologist and a skilled analyst, but she was not immune from making mistakes. 3. Attributing Jericho’s destruction to Egyptians has little historical basis. 4. Jericho had full grain stores at the time of its destruction. Wood says, “In the burnt debris of City IV both Garstang and Kenyon found many store jars full of grain, indicating that when the city met its end there was an ample food supply.”1 This eliminates the possibility that the Egyptians conquered Jericho. The Egyptians used siege tactics to starve out a city, and Jericho apparently had plenty of food when it fell. More importantly, the presence of full grain stores undeniably confirms the biblical account. Excavations at the city have shown that large amounts of grain were stored in the ground floors of houses, indicating that Jericho fell before spring harvest. The Bible confirms this timing, noting that Rahab was drying freshly harvested flax on the roof of her house (Joshua 2:6) and the Israelites celebrated Passover just before attacking Jericho (5:10). The presence of grain stores also supports the biblical observations that Jericho fell quickly (6:15), that the city was not plundered (6:17-18), and that no one fled with food (6:1). 5. Radiocarbon dating confirms the biblical account. According to Wilford in the New York Times, “A three-foot layer of ash, containing many pottery fragments and mud bricks from a wall, was found at the site, well preserved because it was sealed by sediments that accumulated over the years the destroyed city lay unoccupied.”2 Since then, carbon-14 dating, an incredibly reliable method not available at the time of Kenyon, has yielded a destruction date of 1410 B.C., matching Garstang’s original dating.6 Furthermore, Egyptian scarabs (or amulets) found at Jericho have inscriptions from the same period. After examining the evidence, TIME magazine said, “Score one for the Bible.”7 The New York Times said, “It may well be true that, in the words of the old spiritual, ‘Joshua fit [fought] the battle of Jericho, and the walls come tumbling down.’”2 And indeed, the Bible wins this battle, standing strong through the test of time and proving once more to skeptics that its words are truth. Bryant G. Wood, Did the Israelites Conquer Jericho?, Biblical Archaeology Review 16(2):44-58, March-April 1990. Wilford, John Noble. “Believers Score in Battle Over the Battle of Jericho.” New York Times 22 Feb. 1990: n. pag. Web. Davis, Miriam C. Dame Kathleen Kenyon: Digging up the Holy Land. Walnut Creek, CA: Left Coast, 2008. Print. Hoffmeier, James K. Reconsidering Egypt’s Part in the Termination of the Middle Bronze Age in Palestine. London: British School of Archaeology in Jerusalem, 1989. Print. Seiglie, Mario. “Archaeology and the Book of Joshua — The Conquest.” United Church of God. United Church of God, 29 July 1997. Web. 04 Mar. 2017. Lemonick, Michael D. “Science: Score One for the Bible.” TIME 5 Mar. 1990: 43. Web. “The grass withers, the flower fades, But the word of our God stands forever.” Thanks Vinh! Thanks for the encouraging verse, Cindy. I appreciate it! AMEN, BRO. God’s Word is always true. Keep up the good work!!! Thanks, Ben! I appreciate the encouragement!